From the luxurious gardens or the sparkling waters of the Indian Ocean, Sandies Mapenzi Beach Club will ensure that you envisage the sheer beauty of tropical nature. While admiring the luxurious gardens with tall palm trees or the sparkling waters of the Indian Ocean, the Diamonds Mapenzi Beach Club will ensure that you envisage the sheer beauty of tropical nature.Stroll through the gardens to the emerald waters of the Indian Ocean, stretch out on a sun bed, bathe in the blue pool or challenge yourself in one of the many activities or water sports offered by the Resort. 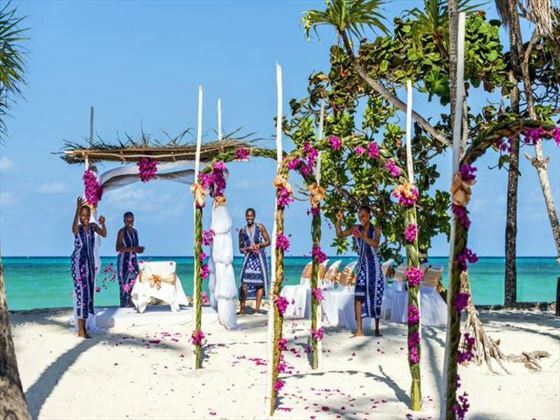 If your are looking for an exotic location where to celebrate your wedding without having to worry about the details, Diamonds Mapenzi is the right place to say your “I Do’s” With a ceremony that takes place on the white sandy beach of Zanzibar overlooking the emerald waters of the Indian Ocean. * Please note: A certified copy is a photocopy of the relevant document which has been stamped and signed (certified) by an authorized Notary Public as being a true copy of the original. The signature should be made in red or blue ink so that cannot be mistaken for a photocopy. 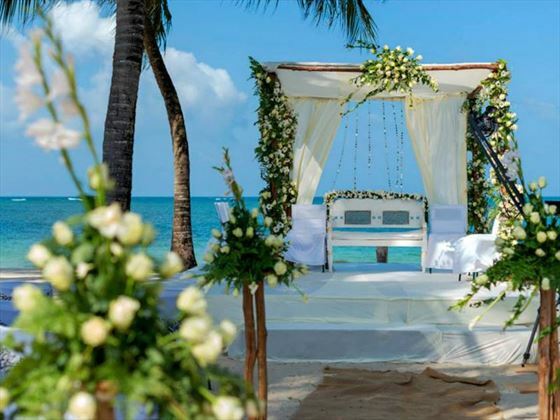 All affidavits for Zanzibar weddings MUST be certified by a Solicitor or a Notary Public with their stamp. The Notary Public stamp (ideally blue or red ink) must clearly show the name of the Notary & that they are Notary Publics - e.g. Harrison/Bennett & Webb Notary Public, 29 Rye brook, Farnborough) accompanied by a signature. Without this, the authorities in Zanzibar will not allow the Wedding to proceed. 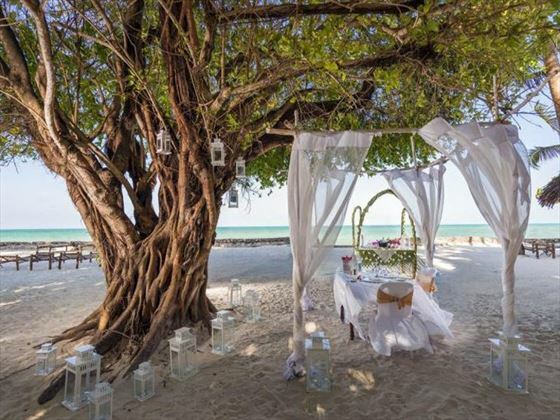 Guests marrying at hotels in Zanzibar will need to send photocopies of the documents listed to us at least 12 weeks before the date of travel. Civil ceremonies must be held in the morning and on weekdays only. Civil Wedding will take place on the beach with the Regional Commissioner coming to the hotel to perform the ceremony; however, in the event that this is not possible it will be necessary to go to the Regional Commissioners Office. Upon returning to the hotel, there will be a symbolic ceremony on the beach with a decorated canopy. In this event, the couple will have to exchange their own symbolic vows. All out door and beach activities are dependent on tides and weather. If couples do not fulfil these requirements you must advise us. Couples should be referred to the embassy of the country of origin and the country where they wish to marry as they may require extra documentation to satisfy their own embassy requirements – Tropical Sky cannot advise on this and couples must investigate this on their own. As Tropical Sky weddings have no jurisdiction over hotels/resorts/venues/legal requirements and their charges, we cannot be responsible for any increases or changes to these wedding arrangements. We will, however, endeavour to advise you of changes as soon as we are made aware of them.